For the past few years, we’ve attended the Online Facilitation Unconference. This year it’s happening from October 22-24 and it is already drawing dozens of dialogue practitioners from North America, Europe, and Asia. The conference is organized by Intellitics Inc, makers of the nifty Zilino platform for online dialogue. The best part of an online unconference is that all the participants have a hand in shaping the agenda by proposing the topics for all the breakout sessions. These “self-organizing” conferences are fun to watch as they come together in under an hour, and the conversations are highly engaging. Early bird pricing for this unconference is still in effect for the next two days, so it is quite affordable. We at QiqoChat are excited to be a silver sponsor, and we hope to see you there! Edcamps are a special type of “unconference” where educators choose the professional development topics they want to cover in small-group breakout sessions. We’re making QiqoChat free for the Edcamp movement to help us get the word out about the tools we offer. How can we better serve you? We look forward to your questions, comments, and suggestions. Email us at hello@qiqochat.com. We’ve all sat through some dry conference calls where we’d rather be doing something else. Today, we’re rolling out a tool for “unconference calls” which you might find to be an attractive solution to this problem. What is an unconference call? When the host is ready, the group can subdivide into audio and/or video breakout tables for a more efficient discussion and then reconvene as a whole group with a single click at the right time. This way, people only need to participate in the discussion that’s most relevant to them. There is a collaborative whitespace where the whole group can brainstorm, share links, and document the conversation. Each breakout table also has its own collaborative whitespace to accompany their breakout session. 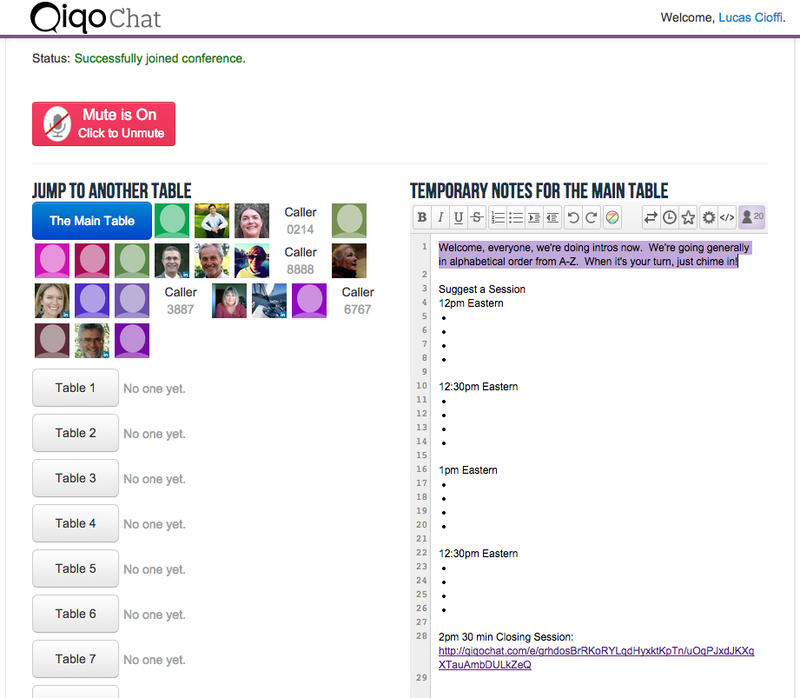 An example of breakout tables on QiqoChat during an “unconference call”. There are a variety of collaborative techniques you can employ when running one of these unconference calls. You could have all tables talking about the same topic or all tables could be talking about different topics. You can choose the topics, or you can let the participants choose the topics of the breakout tables. You could let participants hop between these virtual breakout tables. You could have one person remaining at each table for continuity and have everyone else switch tables every 5 minutes to ensure a cross pollination of ideas. You can link to other tools such as interactive surveys for use during the call. We look forward to seeing people use unconference calls in creative ways to design more interactive meetings.